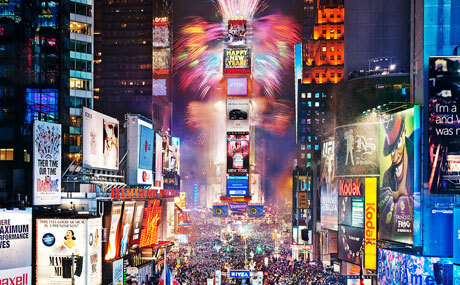 A million visitors are expected in Times Square New Year’s Eve to watch the classic tradition of the Times Square New Year’s Eve Ball Drop. The 12-foot illuminated crystal ball descends as onlookers count down the final seconds of the year. In the lead-up to the New Year, visitors to the Times Square Museum and Visitor Centre can write down their hopes for 2014 for the New Year’s Eve Wishing Wall. Wishes from the wall are then collected and added to the confetti which rains down at midnight. Meanwhile in Central Park the Emerald Nuts Midnight Run takes place at 11.45pm on New Year’s Eve, hosted by the New York Road Runners as well as dancing and a costume contest at the Central Park Bandshell. Brooklyn’s The Coney Island Polar Bear Club offers a memorable start to 2014 with its annual 1st January New Year’s Day plunge into the Atlantic Ocean. The swim is open to the public and starts at 1pm on the boardwalk at Surf Avenue and Stillwell Avenue.